A student was playing with a handgun in the back of a classroom before the firearm went off, forcing a San Francisco high school and nearby schools to go on lockdown Thursday afternoon, according to police sources. Christie Smith reports. At 11:15 a.m., officials received reports of a possible firearm on campus, according to the San Francisco Unified School District. Balboa High School in San Francisco and nearby James Denman Middle School and Leadership School were on lockdown as police investigated. Police sources told NBC Bay Area that a student was playing with a handgun in the back of a classroom before the firearm went off. A student was playing with a handgun in the back of a classroom before the firearm went off, forcing a San Francisco high school and nearby schools to go on lockdown Thursday afternoon, according to police sources. 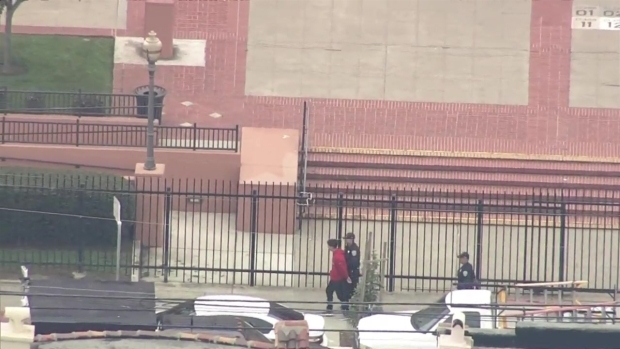 Balboa High School in San Francisco and nearby James Denman Middle School and Leadership School were on lockdown as police investigated a report of a firearm on campus. Four suspects − all students — have been detained in the incident, police told NBC Bay Area. "At this time, one student is under investigation for the firearm discharge, with the three other students being investigated as possible accessories after the fact," police said. On Friday, classes resumed as usual at Balboa, but there will be classroom discussions and extra counseling staff available at the school's teen health center to support students, according to the San Francisco Unified School District. A 14-year-old girl student told NBC Bay Area that the gun went off in her class in the auditorium. She explained that she witnessed one student saying to another, in a joking way, "do you want me to shoot you?" The other student said "yeah OK," not taking the other student seriously, according to the witness. Then, the student with the gun started fumbling with his backpack and the firearm went off, the witness said. The gun and clothing from the suspect youth was later recovered in the backpack of a fellow student at the scene. A firearm and spent bullet casing were also recovered. Students were playing with a handgun in the back of a classroom before the firearm went off, forcing a San Francisco high school and nearby schools to go on lockdown Thursday afternoon, according to police sources. The lockdowns at Balboa High and nearby James Denman Middle School and Leadership School have all been lifted, police said. Parents were sent to the campus football field to collect their children. During the lockdown, authorities had to obtain insulin for a diabetic student.